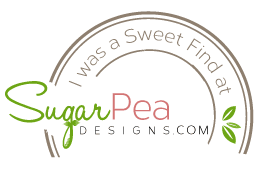 My clean and layered card was inspired by several challenges - the color inspiration at SugarPea Designs, the floral challenge at Krafty Chicks, the Spring Mood Board at Simon Says Stamp and the spring/floral elements from the Card Concept. I created a bouquet of flowers using the challenge colors and arranged them then added Press n Seal over the top before putting it to one side. The message board was easy to create as the die does it all for you. The hardest part was adding all the letters and trying to keep them straight - which they're not! I added the bouquet and then decided to add some stars as a final touch. The stars and some of the flowers were colored with clear sparkle pen for some shimmer. This card is bigger than usual at 5.25 x 5.5" but as I'll be hand-delivering it, it's all good. 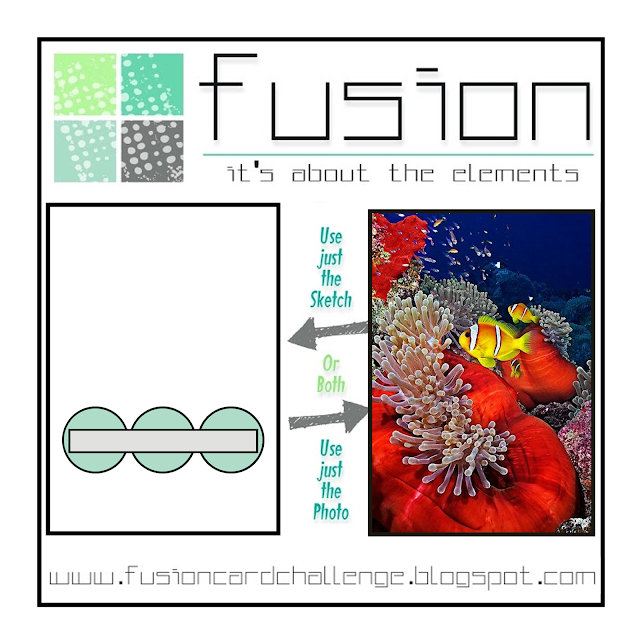 I created a sort of fusion by combining most of the sketch with the fish theme from the photo. 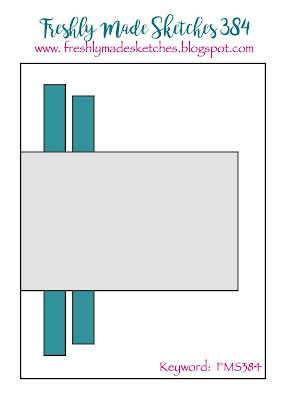 I added the horizontal strip behind the three elements rather than in front, but I hope you can still see the sketch. These fish crack me up! I stamped and colored them with Copics before die-cutting them. I masked off a strip on a white card base and blended on some distress inks. I then added the fish, with the ones at either end popped up on foam tape. I stamped the simple sentiment before adding Crystal Glaze to all the eyes. And that's it! Card done! 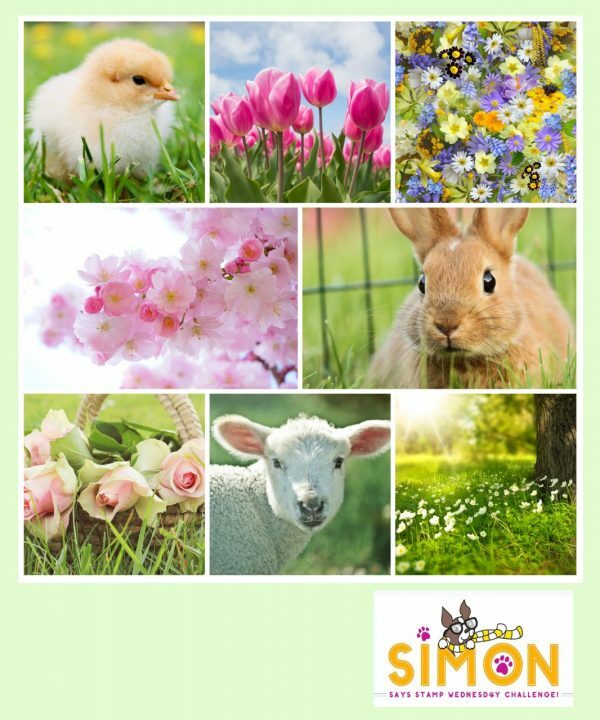 I'm heading into a 4 day Easter weekend, so hopefully I'll have enough energy and mojo to spend a chunk of time in the craft room. It's been about 8 months now since I really wanted to spend time stamping and I'm convinced it's because I'm so busy at work I have nothing left in the tank when I get home! Thanks so much for visiting! I hope you'll check out the gorgeous cards made by the rest of the design team. Hi and welcome! 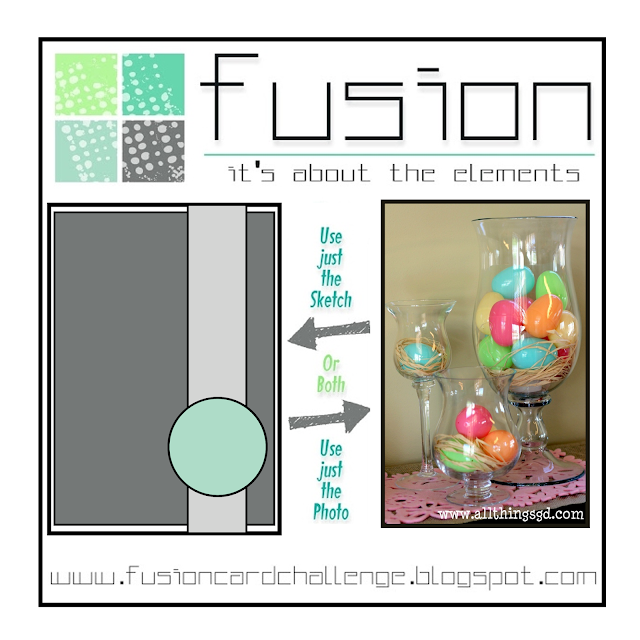 Today's card was made using the latest challenge from the Freshly Made Sketches team where our hostess this week is Linda Callahan. I did some emboss-resist for my card, using the gorgeous Roses All Over stamp from MFT. Finally, I finished with a scripty hello. Thanks so much for visiting! Head on over and check out how the rest of the DT have interpreted Linda's sketch - they're all wonderful! In keeping with my card-making style of the last several months, I went quick and easy and came up with this stenciled and stamp-layered card. I used multiple Altenew inks to stamp the flower and leaves then used the co-ordinating dies to cut them out. 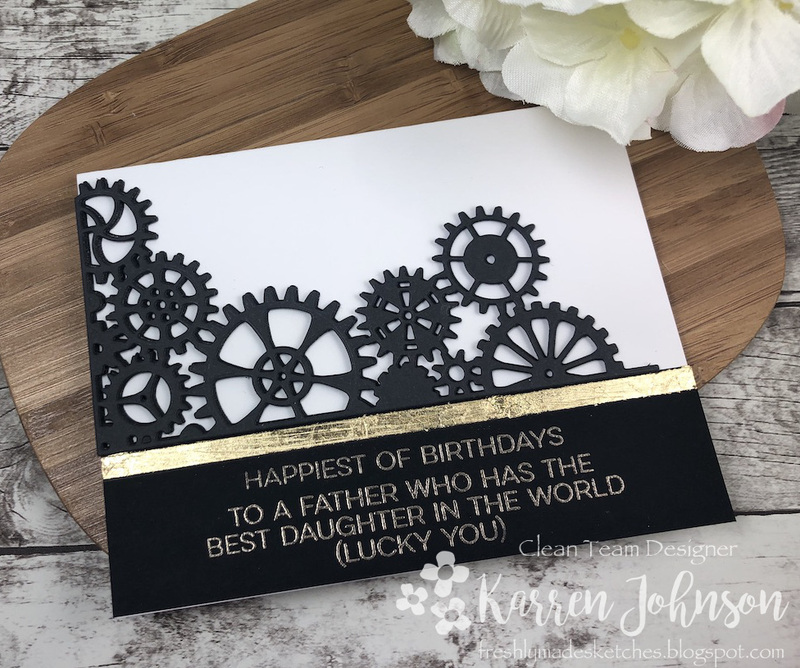 Onto a white card base, I stenciled through the Dot Fade stencil with some white embossing paste colored with some Altenew gray ink. After that was dry, I added the sentiment strip, the scalloped piece and the flower with foam tape. There! Done! Nice and quick! Thanks so much for visiting! 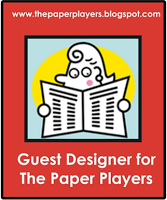 I hope you'll check out the wonderful cards made by the rest of the design team. 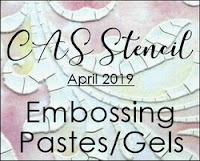 I'm linking up to the CAS Stencil challenge where Barb is asking us to use embossing paste. 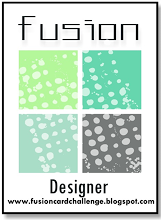 It's time for another fun challenge from the team at Fusion and we've got a bright and cheery one to play along with! I originally decided to focus on the photo and go with a rainbow alcohol-inked panel, which I did, but then I figured I could also incorporate the sketch so went with a fusion. This panel was one I had in my folder of alcohol-ink experiments. 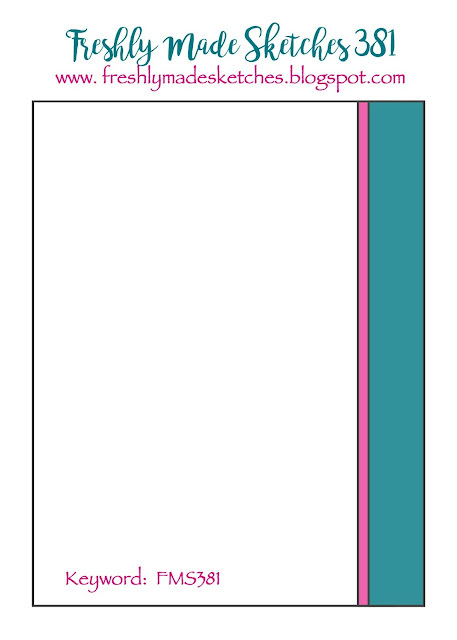 I'm pretty sure I only used a red, green and blue to create this sort-of-rainbow pattern. I also used some gold foil. The panel wasn't wide enough to cover a card front, so I cut it behind the sentiment panel to make it fit. I went with a bold but reasonably simple sentiment stamp and then added a die-cut circle from the inked offcuts and a gold foil star. Pretty simple, right? Thanks so much for visiting! 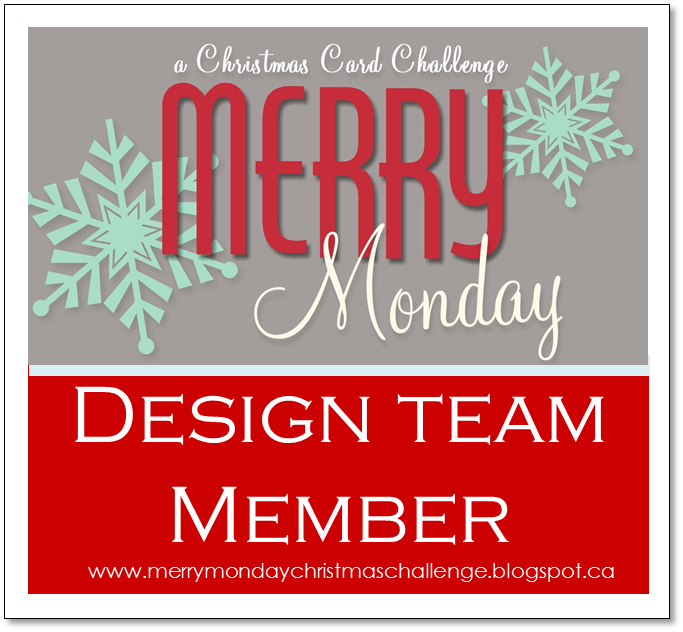 I hope you take the time to check out the cards made by the rest of the design team - they're fabulous! 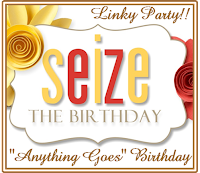 I'm linking up to Seize the Birthday - this isn't a Spring card but it'll work for the Linky Party. Hi and welcome! 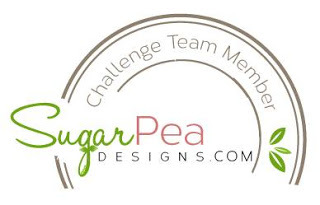 The week is flying by and it's time for another challenge from the team at Freshly Made Sketches. 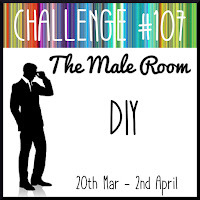 Jennifer Timko is our hostess this week and she has come up with a classic sketch for us to play with. I first did some masking and ink-blending on the background panel of some Bristol Smooth cardstock to create some grass and sky - leaving a white strip where the "road" was going to go. I then adhered the die-cut road in place before cutting the houses and trees out of various scraps of cardstock. I stuck with pastel shades so they didn't take over the card design as it's pretty busy! The sentiment was stamped onto a white strip and adhered directly to the card. The whole panel was then popped up on foam tape and added to a white card base. Thanks so much for visiting! 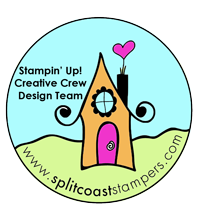 I hope you'll check out the gorgeous creations made by the rest of the DT. Hi everyone! I'm back with a card for the latest Freshly Made Sketches challenge where our hostess this week is Lee Ann Barrett. And what a great, CAS sketch she has for us! I love sketches like this so my mind was whirring! Eventually I settled on this card for my father's upcoming 86th birthday. He'll get a laugh out of the sentiment - not sure how my three sisters will feel though 😃 This has actually photographed darker than it should. 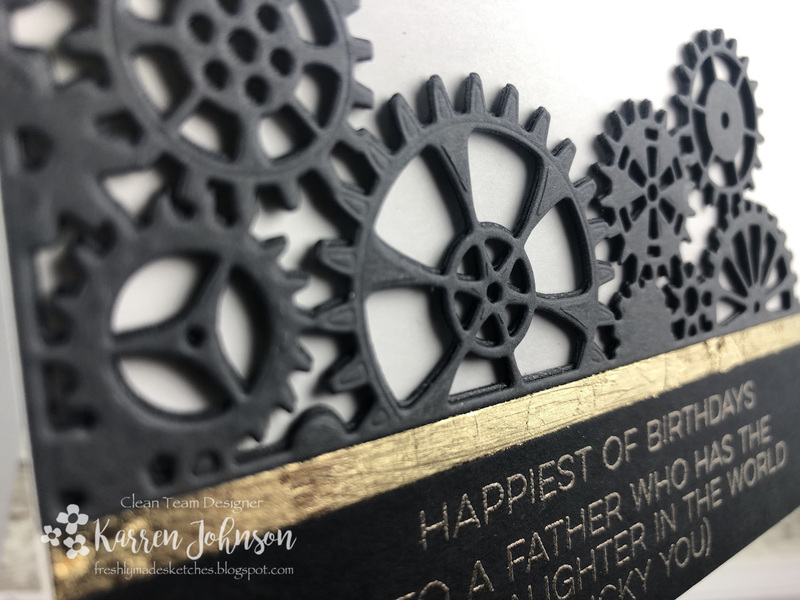 The cogs are dark gray stacked and slightly offset onto black to form a shadow. These are 5 layers deep. Once I was finished layering (thank God for spray adhesive! 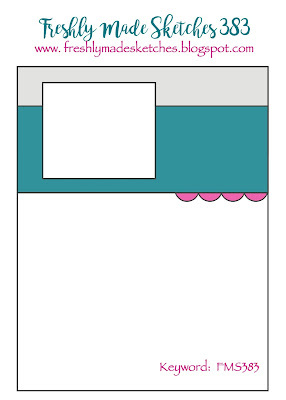 ), I put them to one side and worked on the rest of my card. 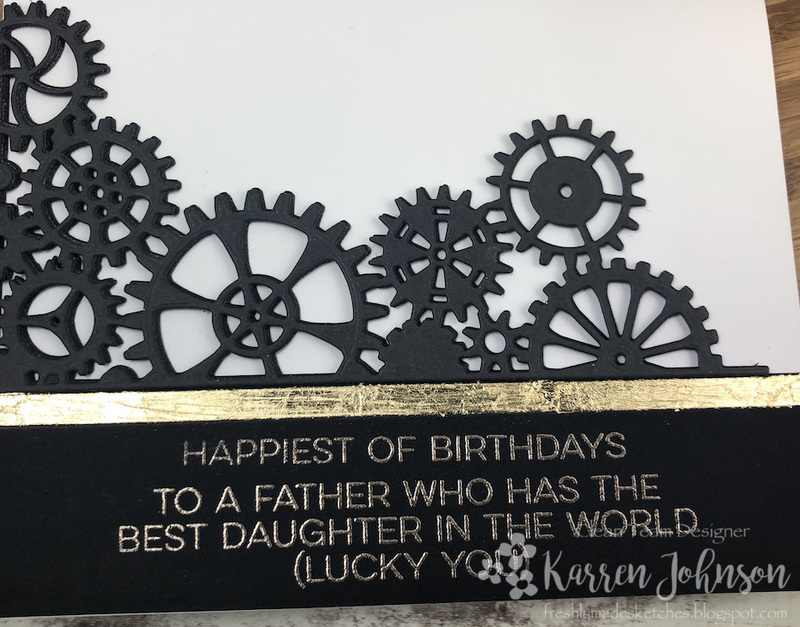 I embossed two separate sentiments from two different stamp sets onto a strip of black cardstock with Platinum embossing powder. I then added a strip of Scor-Tape and burnished on some gilding flakes. I like that they give an imperfect finish - just right for a masculine card, I think! Thanks for visiting! The design team have some gorgeous cards using this sketch, so I hope you'll check them out.